We have in store for our customers jackets & patches that are manufactured using high grade quality material. The offered jackets can be custom designed in accordance to their color, style, size, lining etc. These jackets are available at very competitive & market leading prices and in various color combinations. Being the most eminent manufacturer of garments, we present Varsity Jacket. These jackets are highly appreciated and demanded for its basic features like softness and excellent fitting. These garments can be customized in terms of size, color, and design and stitching as per the requirement of the buyer. 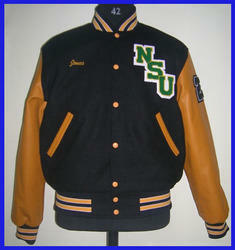 chest "NSU" CHENILLE PATCH, NICKNAME EMBROIDERY & BACK CHENILLE PATCH.